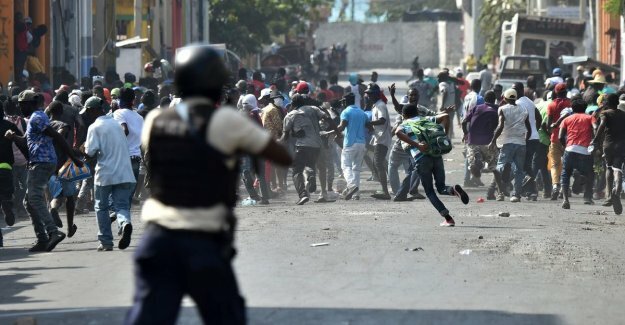 During the violent protests in Haiti today is again one fatality cases. A young man was killed in the presidential palace in Port-au-Prince. The access is blocked by the police, who used tear gas bets. Elsewhere in the capital was also a Haitian journalist by a bullet hit in the arm during a shootout between police and the protesters. Haiti, all week long, thousands of people on the street to the resignation of president Jovenel Moïse to requirements. The demonstrations, which especially young people participate in, there are sometimes very violent. Since the beginning of the protests fell at least seven dead. Meanwhile, start more diplomatic representations according to the local news agency HPN measures. For example, the American ministry of Foreign Affairs, the evacuation of the children of embassy officials ordered. the representation of the European Union has decided to family members of employees to safety in the Dominican Republic.